Well it appears that Black and White is back at the top of the list in the fashion stakes. So it’s no surprise that Scrapbooking fashions have mirrored this and Black and White colour schemes are the current scrapbook fashion trend too. Now I’m not a trendy person. I find keeping up with trends to be exhausting and expensive, so I don’t usually bother. But one of the many charms of scrapbooking is that I can dabble in whatever is the current trend to try it out without making a significant wardrobe commitment and without any peer pressure on me to keep up. So it makes it kind of fun to experiment with a few of the trends as they appear. So how do you feel about black and white layouts? I don’t mean B&W photos, but the whole colour scheme revolving around black and white. I thought it might be fun to set up a Gallery of Black and White. 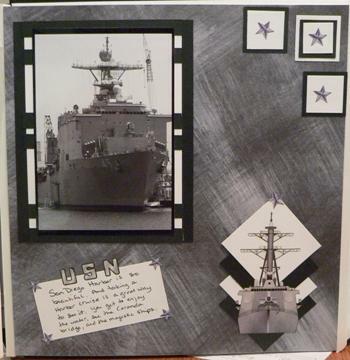 And this can include scrapbook layouts, ATCs, cards, altered objects. The full spectrum of scrapbooking artistry. So do something in black and white and post it on your blog. Put a link it to this post and leave a comment here. And I’ll post your layout (or whatever) on this page with a link back to your blog. I’ll keep updating this post with the gallery additions as they come in so keep popping back to check out the new contributors. Or get Scraps of Mind updates delivered to your Bloglines or Google Reader to make sure you’re notified of updates. 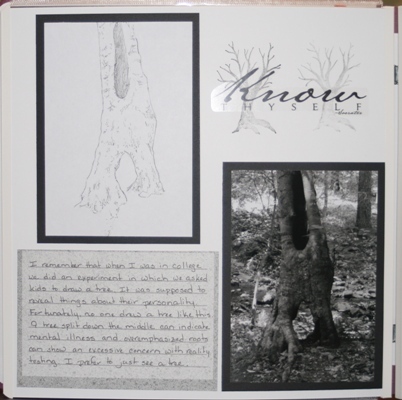 And if you already have a black and white scrapbook layout or card posted on your blog, by all means contribute that link to the gallery. Here are my contributions to kick start the gallery. The first is a card I made at a Hot off the Press workshop for my nephew’s 19th birthday. And the two below are a pair of ATCs called Old Mother Hubbard (on the left) and Nursery Tales (on the right). Great examples, Karen!! I love those ATC – they’re stunning! I’ve only done a couple of B&W layouts in my time (and they are old = not very good) so there’s no way I’m posting them on my blog!! BUT … I do have some new B&W papers and embellies that I have been meaning to use, so I’ll try and do a new page. How long does this “challenge” go for? I won’t have time to do it until later in the week (or over the weekend). I’m thinking of making it an ongoing thing. As people link to this post I’ll add them to the Gallery. If it gets to be too big I might make a separate page and it can be accessed from the top navigation bar. We’ll see how it goes. Look forward to seeing yours. As you know, my friend and I did this as a challenge a while back. Here is a link to my page – http://scrappyhour.files.wordpress.com/2007/06/bw-challenge.jpg – and here is a link to hers – http://scrappyhour.files.wordpress.com/2007/06/lc_black_and_white.jpg. Feel free to post them to the gallery if you choose. Here’s mine. Its for the ADSR but it works for here too! Jan when I click on your link I get a 404 error. And I can’t see your layout. Have you removed it from your blog? Please note everyone. I’ve deleted Jan’s comment with the link to her site at her request as she’s taken the layout off her blog. Just wanted to say your black and white ATC’s are gorgeous !! I once made a great B&W LO of my grandpa fishing by the sea, I can see it from my desk because I had it framed Shall upload it to my blog, so you can see it too ! Just updated my blog with a B&W LO and 2 sets of Artist Trading Cards Thanks for looking ! LOL, guess I need to get busy. Thanks Brigitte and I’ve picked up your black and white contributions to the gallery. Look forward to adding yours too Tink. And it is there…. Just got it up. I am going to get started right away. I can’t wait to show you mine. I have some great things I would like to try. I’ve always loved black & white layouts! It’s just hysterical that they’ve now become trendy. I suppose I’m just a trendsetter. Andréss last blog post..Diseñe Su Habitación! Good examples!! love black & white layouts! I will start soon though it can take a week, how long it will go for? you will like them… soon I will send. B&W Layouts although comparatively less used still steal the show for me when it comes to layouts. There is much depth and intensity to the pictures. It describes much more. I am glad to witness such a post on layouts. Thanks for the info. Been too long since I have blogged or scrapped at that. Thanks for the great article (and inclusion of the layout, lol). Maybe I can find time this next weekend to get something done. Yay Tink! Good to hear from you again. Sounds like life has been getting in the way of virtual life. Hopefully it’s all good things. I’d be delighted for you to share Scraps of Mind with your Faceboojk friends. Thanks very much for the offer.